Our skin is our biggest organ and is capable of absorbing a surprisingly large amount of what we put on it. 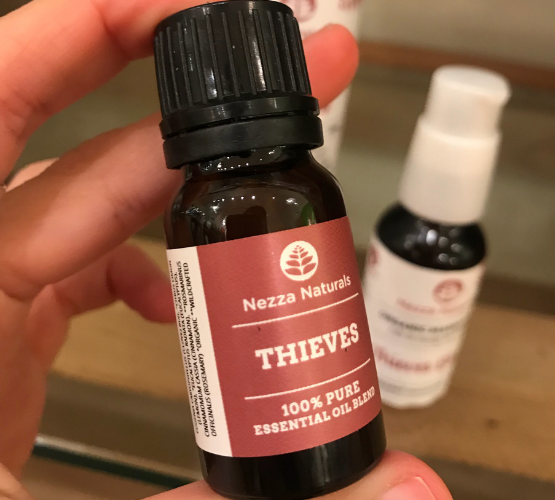 Let us give you all the information you need to know about Thieves Essential Oil Blend and the 12 ways to use Thieves for a naturally healthier home. Many regular cleaning supplies or household products can irritate our bodies, cause headaches, produce allergic reactions, and other health problems, including cancer! Some products release dangerous chemicals, including volatile organic compounds. These are gases that are emitted into the air from products or processes. They can be harmful on their own and can react with other gases to pollute the air your family breathes. Other harmful ingredients include ammonia and bleach. Even products which are “green” or with “natural based” fragrances (most commonly citrus) can react to produce dangerous chemical blends and vapours in your home. Using natural plant-based products is one of the best ways to prevent exposure to the toxic chemicals found in many cosmetics and household products. It is so important to read ingredients and to gain an understanding of what we are putting on our skin, in our homes and ultimately back into the environment. Nature has provided such an amazing array of ingredients that are gentle yet powerfully effective and work on multiple levels. Certain plant-based ingredients like essential oils not only help with skin care but have positive effects on mood and state of mind. Here at Nezza Naturals, our guarantee is to use only high-quality, plant-based ingredients, usually, at high concentration for the best results. The first step to a healthier body and environment is understanding which toxic chemicals are commonly found in cosmetics and household products so that they can be avoided. Part of our commitment to our customers is to share this valuable information and help consumers make informed choices about the products they use. During the Black Plague in the 15th Century, a group of perfumers from Marseilles robbed deceased plague victims and miraculously did not fall ill from the highly contagious disease. Once caught they were given a lesser sentence if they revealed their secret... which was this combination of therapeutic essential oils! Turns out the rich, spicy, and earthy aroma is only the start of it's benefits! What goes into the Thieves Essential Oil Blend? 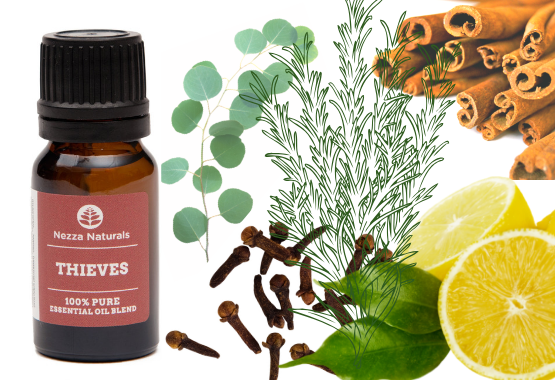 Thieves Essential Oil is an extremely powerful blend of the following essential oils: Clove Bud, Lemon, Eucalyptus, Cinnamon, and Rosemary. Each of these essential oils have amazingly potent properties. When blended together, they can provide serious relief from germs, coughs, colds, and other ailments. Common Uses: tooth pain, stimulates digestion, muscle aches, wounds, increases circulation, immune boosting. During the Renaissance, clove was used to keep epidemics and plagues at bay. It is an excellent pain reliever as it contains a high amount of eugenol. Suppresses inflammation, pain, and fever in the body. Common Uses: Respiratory issues, immune boosting colds, flus, viral infections, congestion, headaches. A refreshing and healing oil. Great for those who feel constricted in their lives, both bodily and mentally. Contains antimicrobial properties to fight all kinds of bacteria for treatment of colds, coughs, and fever. Common Uses: antimicrobial, antiviral, antibacterial. Increases circulation, fights infection, stimulates metabolism, anti-rheumatic. Traditional healers knew the medicinal uses of Cassia far back in history. Common Uses: Assists with muscle pain, nervous tension, and infections. A strengthening and refreshing essential oil. Contains anti-inflammatory properties for pain relief and help with swelling and water retention. Thieves essential oil is well known to reduce stress, function as a broad spectrum immune booster, be highly antimicrobial, anti-fungal, antiviral and antibacterial, purify the air, and provide effective protection against airborne pathogens. In addition to all of this, Thieves essential oil can improve digestion, reduce inflammation, as well as lower fevers, heal skin conditions, aid in weight loss and benefit the respiratory system. Eugenol, the active ingredient in Clove bud essential oil, is known to stimulate the absorption of essential minerals by the body, leading to stronger bones and a lowered chance of issues developing. Winning! Thieves essential oil blend is particularly valuable for people suffering from a weak immune system, gastrointestinal problems, inflammatory conditions, skin irritation, poor respiratory health, obesity, hypertension, and osteoporosis. Add 3-5 drops of Thieves essential oil to your diffuser. This warm inviting scent will freshen the air as well as protect your home from airborne pathogens. Place 2-3 drops of the essential oil onto a hot washcloth. Keep with you in the shower away from the direct stream of water. The steam from the warm shower will disperse the aroma and healing properties into the air for you to enjoy. In a 2 oz spray bottle, add 15 drops of Thieves essential oil blend. Fill the bottle halfway with Witch Hazel and top up the rest with distilled water. Shake to combine. Spritz upwards into the centre of the room or over top of soft coverings and bedspreads. Not too close! This is a misting. Naturally disinfect surfaces for a great clean. Just add 5-10 drops of Thieves essential oil to a small spray bottle and fill with water. Spray on, wipe down. It’s that easy to clean safely and effectively. For sinks, grease, and tougher grime, mix 6-8 drops with baking soda. Scrub, rinse, and wipe the area dry. Works especially well on bathtubs, wash basins and tile flooring for a deep clean that leaves a sparkle. Use to dissolve the gummy adhesive left on items from price labels. Apply ‘neat’ and wipe away. Add a few drops to your laundry cycle for cleaner, fresher smelling clothes. You can also add to your washing machine self-clean cycle to disinfect and get rid of the damp smell. Heat a couple of inches of water in a pot on the stove. In a glass vessel, combine 10 drops Thieves essential oil blend, 3 Tbsp jojoba oil, 2 Tbsp coconut oil, 1 Tbsp cocoa butter and 2 tsp beeswax. Heat until melted. Pour into salve tins and leave to cool. Apply to chest and neck before bed to soothe blocked nose and stuffy chest. Add 10 drops Thieves essential oil blend to a 10ml roller bottle and top with a carrier oil. Shake to combine. Apply to the bottoms of feet before bed to ward off colds and nasties. Make your own antibacterial cleaning wipes! Combine ¾ cup water, 1 Tbsp castile soap, and 20 drops Thieves essential oil. Cut a roll of strong paper towel in half so you have two smaller rolls and remove the inner tube. Place one roll into a mason jar or storage container, pour over the Thieves mixture and squeeze a little to soak. Pull the first cloth from the centre of the roll and the rest should follow! Put a single drop on your thumb and apply to the roof of your mouth. Add a few drops to your dishwasher cycle for cleaner dishes and to remove dishwasher mustiness.